Omranipour, R., Mahmoudzadeh, H., Ensani, F., Yadegari, S., Miri, S. (2017). Duodenal Metastases From Renal Cell Carcinoma Presented With Melena: Review and Case Report. 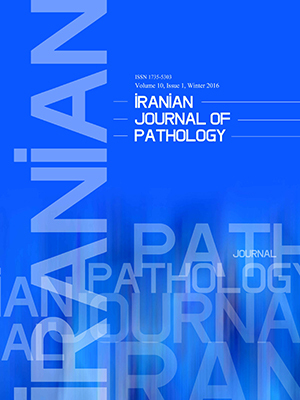 Iranian Journal of Pathology, 12(3), 272-276. Ramesh Omranipour; Habibollah Mahmoudzadeh; Freshteh Ensani; Samira Yadegari; Seyed Rohollah Miri. "Duodenal Metastases From Renal Cell Carcinoma Presented With Melena: Review and Case Report". Iranian Journal of Pathology, 12, 3, 2017, 272-276. Omranipour, R., Mahmoudzadeh, H., Ensani, F., Yadegari, S., Miri, S. (2017). 'Duodenal Metastases From Renal Cell Carcinoma Presented With Melena: Review and Case Report', Iranian Journal of Pathology, 12(3), pp. 272-276. Omranipour, R., Mahmoudzadeh, H., Ensani, F., Yadegari, S., Miri, S. Duodenal Metastases From Renal Cell Carcinoma Presented With Melena: Review and Case Report. Iranian Journal of Pathology, 2017; 12(3): 272-276. Renal cell carcinoma (RCC) metastasis to duodenum is very rare and only a few case reports are available in the literature. We here reported a patient with solitary duodenal metastasis presented with melena six years after right nephrectomy. The patient underwent upper gastrointestinal endoscopy showing ulcerative mass at the second portion of duodenum and biopsy of this mass was consistent with metastatic RCC. Metastasis work up did not find any other site of malignancy, thus Whipple’s operation (Pancreaticoduodenectomy) was performed. In conclusion metastasis from RCC should be considered in mind in patients with history of nephrectomy presenting with gastrointestinal symptoms and a complete evaluation, especially endoscopic examination followed by biopsy, is suggested. 1. Gajendra S, Sachdev R, Mohapatra I, Goel R, Goel S. Metastatic Renal Cell Carcinoma: An Unusual Cause of Bleeding Pancreatic Mass. J Clin Diagn Res 2015;9(9):7-15. 2. Willis RA. Secondary tumors of the intestines. in: The Spread of Tumor's in the Human Body. ed 3. London. Butterworth & Co Ltd; 1973. 3. Vootla VR, Kashif M, Niazi M, Nayudu SK. Recurrent Renal Cell Carcinoma with Synchronous Tumor Growth in Azygoesophageal Recess and Duodenum: A Rare Cause of Anemia and Upper Gastrointestinal Bleeding. Case Rep Oncol Med 2015;2015:143934. 4. Rustagi T, Rangasamy p, Versland m.Duodenal Bleeding from Metastatic Renal Cell Carcinoma. Case Rep Gastroenterol 2011;5:249–257. 5. Sellner F, Tykalsky N, DeSantes M, Pont J, Klimpfinger M. Solitary and multiple isolated metastasis of clear cell renal cell carcinoma to the pancreas: An indication for pancreatic surgery. Ann Surg Oncol 2006; 13:75-85. 6. Crippa S, Angelini C, Mussi C, Bonardi C, Romano F, Sartori P. Surgical treatment of metastatic tumour to the pancreas: A single center experience and review of the literature. World J Surg 2006; 30:1536-42. 7. Eidt S, Jergas M, Schmidt R, Siedek M. Metastasis to the pancreas- an indication for pancreatic resection. Langenbecks Arch Surg 2007; 392:539-42. 8. Rustagi T, Rangasamy P, Versland M. Duodenal bleeding from metastatic renalcellcarcinoma. Case Rep Gastroenterol 2011; 5(1):249–57. 9. Bhatia A, Das A, Kumar Y, Kochhar R. Renal cell carcinoma metastasizing to duodenum: a rare occurrence. Diagn Pathol2006; 1: 29-31. 10. Waalkes S, Schrader AJ, Kuczyk MA. Current treatment options for disseminated Renal Cell Carcinoma. Eur Urol Suppl 2012; 11:73–8. 12. Lynch-Nyhan A, Fishman EK, Kadir S. Diagnosis and management of massive gastrointestinal bleeding owing to duodenal metastasis from renal cell carcinoma. J Urol 1987; 138:611-613. 13. Nabi G, Gandhi G, Dogra PN. Diagnosis and management of duodenal obstruction due to renal cell carcinoma. Trop Gastroenterol2001; 22: 47-49. 14. Cherian SV, Subhraleena D Garcha AS. Recurrent renal cell cancer presenting as gastrointestinal Bleeding .World J Gastrointest Oncol2011 ;15 3(6): 99-102. 15. Geramizadeh B Mostaghni AH ,Ranjbar Z. An Unusual Case of Metastatatic Renal Cell Carcinoma Presenting as Melena and Duodenal Ulcer, 16 Years After Nephrectomy; a Case Report and Review of the Literature .Iran J Med Sci March 2015; 40 (2);175-180. 16. Hsu CC, Chen JJ, Changchien CS. Endoscopic features of metastatic tumors in the upper gastrointestinal tract. Endoscopy1996; 28: 249-253. 17. Teo MY, Ryan B, Swan N, McDermott RS. A Case of Metastatic Renal Cell Cancer Presenting as Jaundice. World J OncoL 2010;1:218-20. 18. Toh SK, Hale JE. Late presentation of a solitary metastasis of renal cell carcinoma as an obstructive duodenal mass. Postgrad Med J 1996;72:178-9. 19. Zhao H, Han K, Li J, Liang P, Zuo G, Zhang Y. A case of wedge resection of duodenum for massive gastrointestinal bleeding due to duodenal metastasis by renal cell carcinoma. World J Surg Oncol 2012;10:199. 20. Antonelli A, Arrighi N, Corti S, Legramanti S, Zanotelli T, Cozzoli A, et al. Surgical. treatment of atypical metastasis from renal cell carcinoma (RCC). BJU Int 2012;110: 559-563. 21. Sadler GJ, Anderson MR, Moss MS, Wilson PG. Metastases from renal cell carcinoma presenting as gastrointestinal bleeding: two case reports and a review of the literature. BMC Gastroenterol 2007; 7: 4-6. 22. Hsu CC, Chen JJ, Changchein CS. Endoscopic features of metastatic tumor's in upper gastrointestinal tract. Endoscopy 1996;28:249–253. 23. Toh SK, Hale JE. Late presentation of a solitary metastasis of renal cell carcinoma as an obstructive duodenal mass. Postgrad Med J 1996;72:178–179. 24. Le Borgne J, Partensky C, Glemain P.Pancreaticoduodenectomy for metastatic ampullary and pancreatic tumors. Hepatogastroenterology2000;47:540–544. 25. Freedman AI, Tomaszewski JE, Van Arsdalen KN. Solitary late recurrence of renal cell carcinoma presenting as duodenal ulcer. Urology 1992;39:461–463. 26. Mascarenhas B, Konety B, Rubin JT .Recurrent metastatic renal cell carcinoma presenting as a bleeding gastric ulcer after a complete response to high-dose interleukin-2 treatment. Urology 2001;57:168–169.